In addition to academic teaching, clinical care and research, Sri Balaji Vidyapeeth also involves itself in a range of activities in fulfillment of the deemed University’s societal obligations. The deemed University’s faculty and staff regularly interact with the community and the impact of the deemed University has had a very large positive impact on the community it serves. Sri Balaji Vidyapeeth takes its social obligations that accompany the attainment of knowledge seriously and participates in every national program, scheme or project aimed at betterment of the common citizen in all walks of life. The deemed University supports and devotes considerable resources towards various social programs such as Swachh Bharat Abhiyan, Digital India, Skill India, etc. Sri Balaji Vidyapeeth has initiated numerous projects towards environmental, community and patient welfare. A few of the initiatives include Water conservation, Renewable Energy, In campus recycling of waste, etc. Recently, as part of the deemed University's CSR, SBV undertook repair of water canals as part of the 'Mission Water Rich Puducherry'. 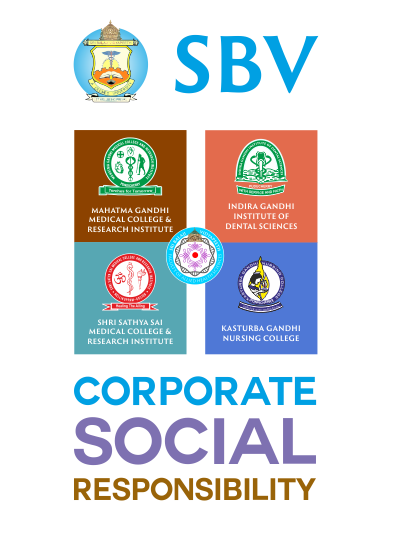 Sri Balaji Vidyapeeth, Deemed to be University, accredited by NAAC with A Grade has been undertaking various activities in the community under its Institute Social Responsibility for the years since its inception. To mention a few, SBV during the last year SBV took the initiative and desilt the nearby ponds in the areas of Pinnachikuppam, Manapet etc. This activity has helped the community in storing the rain water for the village consumption, agricultural activates and for the live stocks without going waste. Because of this nearly 5 villages have benefited. This year we have undertaken the ISR activity on a larger scale under the scheme WRP (Water Rich Pondicherry). Scaling and desilting the Kuttianpakkam canal which originates from Thenpennai river to Bahour main lake. The length of the canal is 10 kms, breadth is 3 mts and depth is 2 mts at a cost of around 6 lakhs. This activity will benefit the Bahour community at large in dealing with water consumption, storage, and agricultural activities. This activity had removed the sludge obstructing the water flow. The rain water has been routed to the storage point in Bahour which has helped in better use of the rain water not going waste in Puducherry which is termed to be water rich. 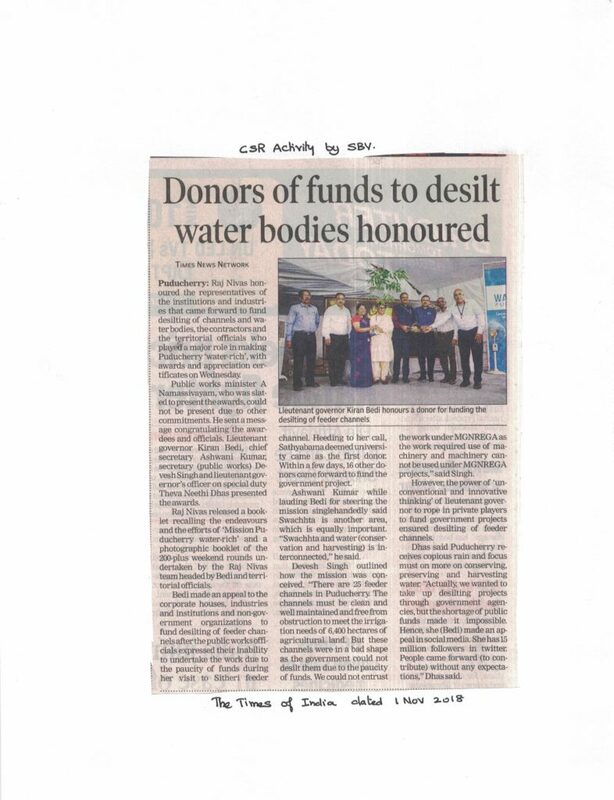 The Hon’ble Lieutenant Governor of Puducherry Dr. Kiran Bedi honoured the team SBV for the funds provided to desilt water bodies in the presence of Mr. Ashwani Kumar, Chief Secretary of Puducherry on 30th October 2018. Sri Balaji Vidyapeeth in its commitment towards the community has taken up the responsibility of renovating the Lord Murugan temple at the nearby Pillaiyarkuppam village. It has spent Rs. 3,00,000 towards the Granite laying in the temple campus. SBV as an institution wants to support the neighborhood community and wants to keep the community self-satisfied and self-reliant. By doing so, SBV aims the community grooms itself for a better growth on their own. SBV just remains an instrument for the same. The birth anniversary of our former president and missile man of India was observed on 15th October 2018. Sri Balaji Vidyapeeth, Deemed to be University, Pondicherry sponsored for the entire issue of the The Hindu in school daily, a special edition to honour Dr. A.P.J. Abdul Kalam on his birthday which was distributed to the school children free of cost. 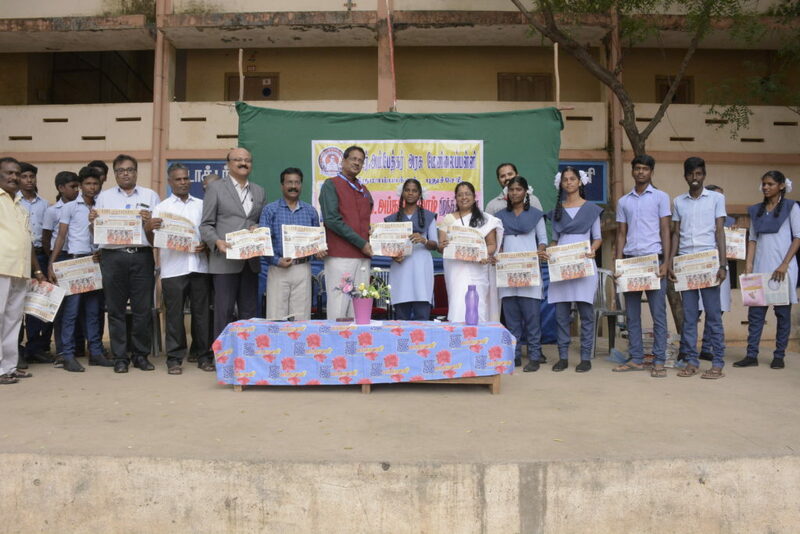 SBV had sponsored for the entire issue on 15th October 2018 and also for an additional of 20,000 copies that were distributed mainly to the school students of Government schools in Puducherry and neighbouring Tamil Nadu. A total of 1,70,000 copies were printed and distributed to the Government as well as Public schools in Chennai, North Arcot, Cuddalore, Villupuram, Thiruvanamalai districts including Pondicherry. The magazine portrayed the life of the beloved leader, his achievements, his dreams, his vision and his tips for the budding future leaders in simple English. In this connection a small function was organized in Bharathy Government Higher Secondary School, Kirumampakkam, Pondicherry to felicitate the noble leader. 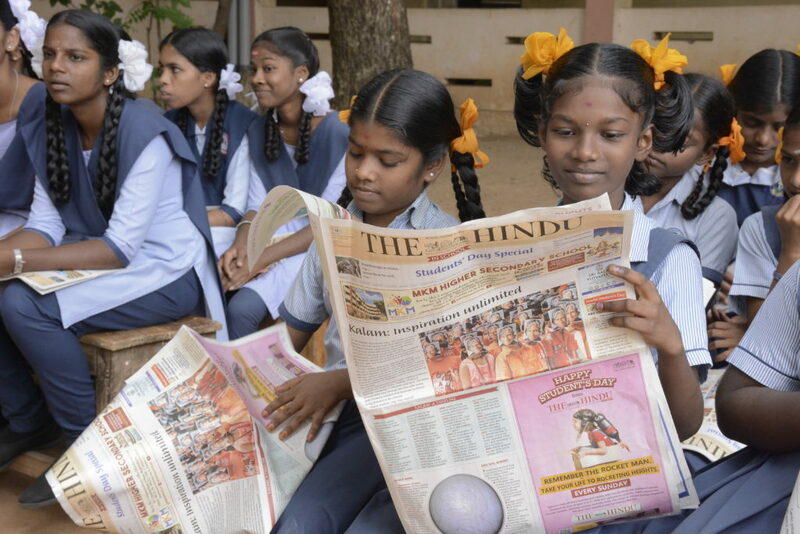 Prof. Subhash Chandra Parija, the Vice-Chancellor of Sri Balaji Vidyapeeth participated as the Chief Guest and distributed the copies of The hindu in School to all the children of that school. In his address to the students, he highlighted the life of Dr. A.P.J. Abdul Kalam and the struggles he faced and how he overcame them. Registrar of Sri Balaji Vidyapeeth, Prof. A.R. Srinivasan spoke about the missile journey and the achievements of the leader. Speaking on the occasion, the Principal of the school spoke on the availabilities available to the children and how they can better use of them. He congratulated SBV for their wonder full efforts in this activity. The SBV team lead by the Vice Chancellor included Registrar, General Manager (Admin. ), SBV, Mrs. Asha Suresh Babu and the Deputy Registrar, Mr. Joseph Naresh. The approximate cost involved for the event was Rs. 96,000 which was sponsored by Sri Balaji Vidyapeeth, as a part of its commitment towards its Corporate Social Responsibility. Sri Balaji Vidyapeeth, Deemed to be University, Pondicherry in its solidarity and concern for the people of Kerala who were affected by the recent rains, landslides and deluge has contributed to the Kerala Chief Minister’s Distress Relief Fund. The Vice Chancellor of SBV, Prof. Subhash Chandra Parija on behalf of the Chancellor Shri. 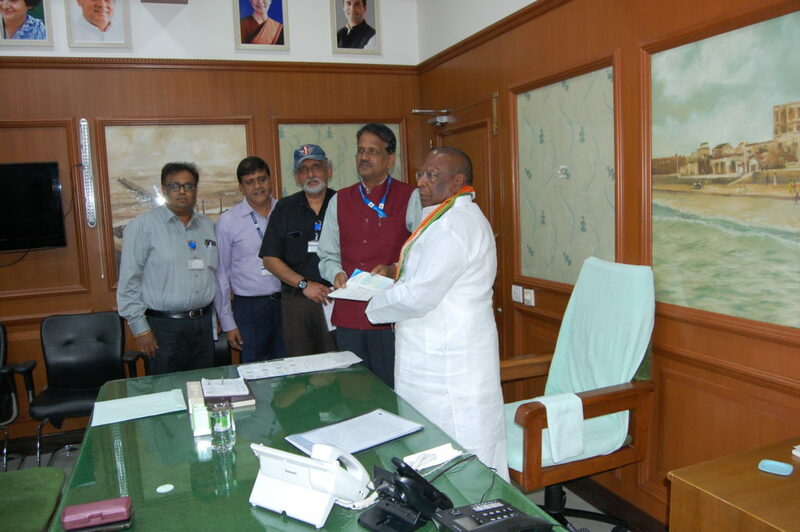 M. K. Rajagopalan and the employees handed over as Demand Draft of Rs.23,92,982/- (Rupees Twenty three lakhs ninety two thousand nine hundred and eighty two only) towards the Kerala Chief Minister’s Distress Relief Fund, through the Hon’ Chief Minister of Puducherry, Shri. V. Narayanasamy which will be forwarded to the Chief Minister of Kerala. The employees, Faculty and other Staff have contributed from their salary to be Fund along with the contributions from the Management of Sri Balaji Vidyapeeth.